as the sun kisses the desert dunes near the Sam village in Jaisalmer, it signals the end of a hectic day for the tourists. This has been the last leg of their journey into the unknown. They return to their desert camp near the Sam dunes tired and hungry. However, a surprise awaits them -- a sumptuous fare of traditional desert food. As the tourists laze on their charpoys (cots) inside the tents, a lad wearing a bright red turban comes and serves rabori , an appetiser made of bajra, jeera, chach and salt, in earthen cups. While the tourists enjoy the soothing strains of algoza , a traditional flute-like instrument, they are served with the popular Khejri ( Sangri ) vegetable with bajra rotis (bread) laced with ghee (butter). "Be it bajra ki roti , plain roti or makka ki roti , a liberal quantity of ghee is a must," says the chef Kishen Maharaj. As the tourists start delving into their bowls of khejri, they want to know more. Regaling in the spotlight, Maharaj divulges a little. "Boil some water and put haldi (turmeric), salt and the sangri (boiled khejri ). Then warm up some oil add hing , jeera, mustard seeds and keep it aside. Then mix it with the vegetables." 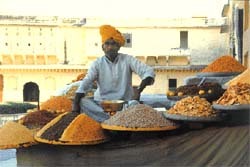 Oasis of food The desert areas of Rajasthan are abound with khejri . It is considered a blessing. It provides shelter to weary travellers and is grazed by camels, goats and other livestock. Its leaves and shoots provide vegetables for people. The young pods, called sangri are also eatable. The mature pods, that contain a sweet pulp is eaten as a fruit. The bark of the tree is eaten during drought. It is stripped off, dried and ground with any available coarse grain to augment a meagre meal. The gum obtained from khejri , known as bantaka is also eaten. The sangri is boiled and preserved in a kalsi or matka (container). In fact, with the growth of tourism khejra vegetable is served in many hotels of the state. "Nothing stands still. Therefore, characteristics of the desert are also changing fast. People are more interested in money and therefore they are selling desert foods to buy fresh vegetables. For example, one kilogramme of khejri fruit sells for Rs 50-100. Migration is another factor. While the original desert people are leaving for the cities, there is reverse migration due to the Indira Gandhi Canal. Many have come to the desert from other areas and now they have become the desert people. But they do not know anything about these plants. Subsequently, there is a loss of indigenous knowledge," says Narayan Das Prajapati, owner of Jodhpur-based Rajasthan Agro-Forestry Corporation. He adds that with the growth of tourism and a good road network, there is now a good scope for earning money from other jobs. "This has weaned people away from traditional food systems because they are difficult to procure and preserve," adds Prajapati. Meanwhile, having polished off the first course, the tourists learn more about the meals that the desert people thrive on during times of food scarcity. One of the organisers of the camp, Trilok Singh, says that on the undulating expanse of the sand dunes is written the story of a race of hardy people who have learnt to play by the rules of nature and survive gallantly. Nature, on its part, has provided them with alternate food resources, if not water. "These foods have saved us during troubled times. We preserve the sangri in a kalsi or a matka . We also make roti of lana ," says Phool Devi, a resident of Sam. " Khejri fruit is known as khokha and is usually eaten raw by the people. Its leaves contain nearly 12 per cent protein and are also called loong , which has great fodder value. In villages the inflorescence of khejri is used to prevent miscarriages," explains N K Bohra of Jodhpur-based Arid Forest Research Institute ( afri ). Back at the desert camp, the dinner proceeds to a more sumptuous fare. Along with the vegetables, a pickle preparation from ker ( Capparis decidua) and a vegetable treat of kumat ( Acacia sengal ) is served. The seeds of kumat have been boiled and dried before being cooked. The half-ripe fruit of ker is boiled and after drying can be used as vegetable. "The fruits of ker are a favourite. It grows in abundance and also we pick them for acchar (pickle preparation)," says Motia, a eight-year-old of Damodara village. The other dish that is a real steal is the Panchkuta which is made of five fruits from the local plants. It includes seeds of kumat , fruits of ker and khejri, khachri ( Cucumis supp.) and goonda ( Cordia mixa) . They are mixed and fried after adding required condiments are added. Also on the fare are vegetables of goonda , goondi and sahajan ( Moringa oleifera) . And of course, the perennial favourite Imli chatni ( Tamarindus indica ). Tamarind seeds are also used in vegetable preparations. The imli plant is often planted in public places and near wells. The fruit is reduced to powder and chewed, like betelnut, and is popular with women. The meal is rounded off with peelu ( Salvadore oleoides) , also called mitha jaal and khara jaal . This fruit grows even in saline soil. "During food scarcity, people also eat the fruits of neem ( Azadirachta indica ) which has a great medicinal value," says Bohra. " Ber ( Zizyphus nummularia) is eaten fresh and the leaves known as pala is used a fodder. Pala is very rich in protein," he adds. The ber root is also good for colouring and the fruit is rich in protein and carbohydrate, says Prajapati. Then there is phog (Calligonum polygonoides) whose flowers and buds are eaten with curd. Bhurat , a type of grass found abundantly in the region, is considered highly nutritious food. The seeds are considered to contain a very high fat and protein content, says Bohra. Other desert foods include toos , whose seeds are mixed with flour and prepared into chapatis (bread) and matira, a succulent fruit, is eaten fresh. The seeds are dried and pounded into flour, which is then mixed with flour of bajra to prepare cakes called sogra and arjuna whose bark is ground, mixed with flour of bajra and eaten. But for the residents of the desert, times are changing. And so are their food habits -- they are now relying on vegetables from the market. "It is not very easy to live on traditional foods because gathering them and preserving them is time-consuming and a very difficult task. And as people outside the desert learn the nutritious value of some of the trees of the desert, they have started buying it. Also, since many have medicinal values, they are exported. The liquid cash we earn by selling them is more important now," says Tikaram of Kanoi village. Prajapati says that bui (small shrubs with cotton like formation on them) is being lost but they need to be preserved because they bind the desert soil. The Indira Gandhi Canal has encouraged farmers to increase agricultural production in many areas. khejri cultivation has decreased because it is being used as wood, ker is being rooted out to increase cultivation area. "The emergence of tractor has played havoc as far as plants are concerned, because the tractor hulls scoop the roots of the local plantsthat take at least 10-12 years to grow. Therefore, it will be very difficult to replenish them. Moreover, with greater water availability, farmers have resorted to more profitable crops like groundnut and mustard," says Prajapati. Whether these traditional, inexpensive and nutritious foods will stand the test of time, remains to be seen.